Isn’t it a little strange that your roof — the barrier between you, your family and the wild elements — is essentially a stranger to you? You generally see your roof from a distance. Even then, you’re just seeing the shingles. You rarely trod upon your roof itself. You know it’s important, obviously, and you know that roof replacement is a big job when the time comes. What, however, do you know about the whole roof system? Maybe not much. Let’s peel back the shingles, metaphorically speaking, and take a look at everything that is inside of your roof. This inside knowledge will help you to understand how your roofing system protects your home and your belongings, and may give you a greater appreciation of the clever science that powers an effective, efficient roof. With these components in mind, let’s now consider the role that each piece plays in the greater whole. The roof deck is the structural foundation of the roofing system. You can often see the roof deck from inside an attic. All of the other roofing materials are nailed to this deck. The roof deck must support the weight of the roofers, snow coverage or any other unexpected visitors to your roof like heavy tree branches. The deck is also the final layer of protection between your home and the outdoors, which means that a.) it needs to be strong, and b.) it must be well-protected itself. Water from rain or snow melt, for example, that gets through the top layers of roofing materials can compromise and eventually ruin the deck — and once that happens, your entire home is in trouble. Roof decking is usually made from plywood or a composite material like oriented strand board (OSB). How hefty should roof decking be? good question, and the answer is dependent on the type of home you live in. Underlayment is an added layer of water-resistant or waterproof material that is applied directly to the roof deck. The underlayment offers blanket protection of the crucial plywood surface supporting the weight of the roofing system. Underlayment is applied under the shingles and functions as a water-resistant, breathable barrier and can be fire-rated to help minimize the spread of fire in multi-family homes or fire-prone regions. Asphalt-saturated felt and synthetic underlayment are water-resistant. Rubberized asphalt underlayment is waterproof. With that in mind, however, remember that underlayment isn’t intended to be the ultimate water-resistant barrier. In other words, it’s not a substitute for shingles (and given how unattractive an underlayment-exposed roof would look, why would you want to do that?). Fire, heat, wind, rain, snow and ice each affect the whole roof system in different ways. Talk to your roofer when you’re planning a new roof — choose an underlayment based on your regional climate and your roof’s specific needs. Flashing is the corrosion-resistant metal applied to a roof at the edges of walls or chimneys. These edges are known as eaves (roof edges that extend beyond the exterior walls of the home) and valleys (the low, angled areas that are formed where two sloping roof planes intersect and form a seam). Flashing is made from material like galvanized steel, aluminum, terne, stainless steel or copper and you can see the flashing when you look at a roof. Flashing’s role is very important to the health of your roof. Why? Quite simply, flashing gets rid of water. Otherwise, even with the best shingles and underlayment, water sneaks through the eaves and valleys of a roofing system and begins the slow, insidious process of ruining a roof. A combination of all four flashing types are often used as part of your whole roof system. Shingles are the outermost roofing material and the first line of defense in the whole roof system. Asphalt shingles are the most common type of shingle used in residential homes. In fact, roughly 80 percent of American homes use asphalt shingles. Why? Asphalt shingles solve a lot of problems. An asphalt shingle is fairly durable and lasts anywhere from 20 to 30 years, and shake-style asphalt shingles last significantly longer (although you pay more). 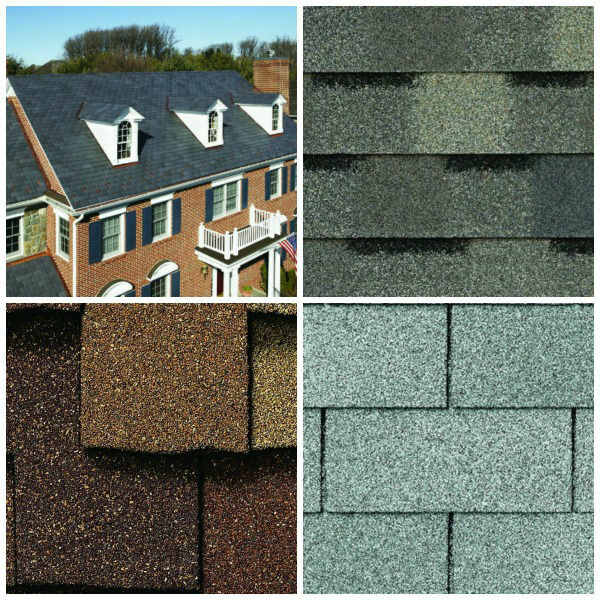 Asphalt shingles look great and come in a wide array of colors, textures and styles. While asphalt shingles don’t have the lifespan of ceramic or slate shingles, the affordability is unmatched. The cost of an asphalt roof per square— a square is 100 feet of surface area, which is how roofing contractors measure a roof — is over 90% less than slate and over 80% less than a metal roof. Read more: Why are asphalt shingles right for my roof? Did you know your roof needs to breathe? Ventilation is one of the most critical components of the whole roof system, and many people don’t even know that it’s happening. Roof ventilation is the flow of air on the underside of a roof deck due to passive and thermal forces. When a roof is ventilating correctly, warm, moist air escapes while allowing cooler, drier air to enter the attic space of a home. This may seem odd — why do I want air flowing through my attic and my roof — but makes more sense as you think it through. Without ventilation, your attic gets warm and moist. This moisture can damage wood, insulation and other building materials when the condensation created by this moisture is trapped in the attic of an unvented home. The vented attic has specially designed gaps at the roof ridges and under eaves that allow moisture to escape with airflow. Read more: Why does my home have wet walls? A properly vented attic has other benefits. You’ll enjoy fewer dramatic temperature fluctuation. Your energy bills stay lower. By keeping moisture out of your attic, you’ll also keep your roof from rotting from the inside out — you don’t want that roof deck getting wet from the outside weather or the inside climate! Poor ventilation also creates what’s known as ice damming and causes major home problems during winter months. You get a nice snowfall and your roof is covered in powder. Not for long! Your unventilated attic is very warm, causing that snow to melt and run off your roof, over the flashing and down towards the gutters. That’s a good thing, right? The roof system in action! Unfortunately, no. Once that runoff gets away from the roof and into the gutters, it is once again exposed to freezing temperatures. The water freezes, effectively damming the gutter. More snow melts, more water builds up, more ice forms. You start to get those long, dangerous icicles hanging from your gutters and roof. This ice tears roofing materials apart, rips your gutters from your home and opens cracks and crevasses that allow water to rush into the deeper layers of your roof. All bad news for you and your home. Roof ventilation systems are unique to every home. Wind, convection and other forces use vents when possible and fans are needed to improve airflow. Long Roofing is here for you. Our whole roof system is backed by a 50-year, non-prorated, transferrable warranty and a 100% satisfaction guarantee. We build trust and peace of mind into every Long Roofing roof. Give us a call at (800) 417-5664 or contact us online today. This post was originally published on July 19, 2016 and has been updated for content and clarity.